Grapes are an excellent fruit for fresh use or processing into jam, jelly, juice, pie or wine. 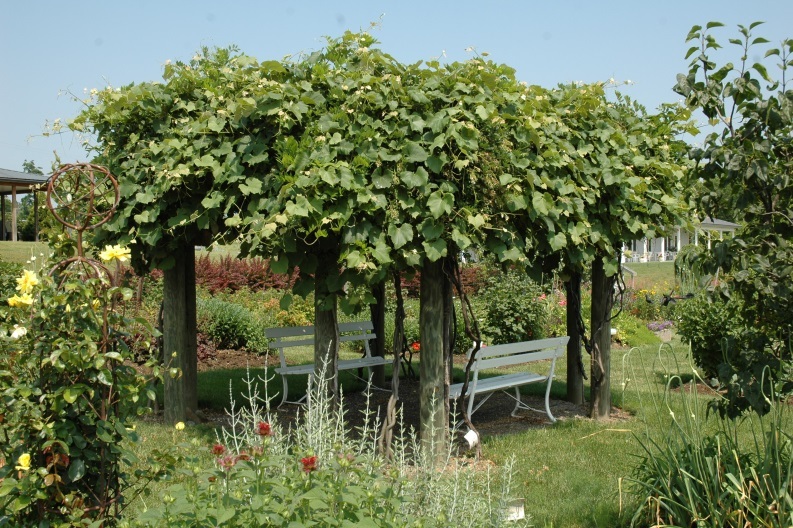 In addition, grapevines can be ornamental and valuable as shade or screen plants in the home landscape when trained on a trellis or arbor (Figure 1). A mature and well-maintained grapevine can produce up to 20 pounds or more of fruit per year. Once established, well-tended grapevines can be productive for 40 years or more. Home fruit gardeners can be quite successful if they select the correct site, right cultivars, and appropriate training and trellis system, maintain a good fertility program, follow an effective pest management program and properly prune grapevines annually. Figure 1. A beautiful grape arbor at a winery in the Finger Lakes Region in New York. Photo by Gary Gao, OSU South Centers. Grape cultivars may be of the American, European or French hybrid types. American and French hybrid types are better suited to Ohio growing conditions because they tend to be more winter-hardy. It is important to select grape cultivars with excellent taste and good disease tolerance. Refer to the Tables 1 through 4 for suggested grape cultivars and their cultural characteristics and disease susceptibility. European grapes are typically not recommended for home plantings since they are not winter-hardy in Ohio, unless home grape growers are willing to provide winter protection. Concord Blue Hardy Late Most commonly grown backyard grape. Fredonia Blue Hardy Mid-season Earlier Concord, vigorous. Steuben Red Hardy Midseason Spicy flavor; non-uniform color. Catawba Red Hardy Late Used for wine and sherry. Delaware Red Hardy Midseason Used for wine; stores well. Niagara White Hardy Late Midseason Used for wine and white juice. Note: New fruit cultivars that may be superior to currently suggested cultivars are constantly being released. Check with your local Extension educator or the nursery you order plants from to obtain information on newly released cultivars for your location. Canadice Red Moderately Hardy Very Early Productive; good clusters. Einset Red Hardy Very Early Slip skin; mild strawberry flavor. Himrod White Moderately Hardy Very Early High quality; straggly clusters. Marquis White Hardy Midseason Highly productive; high quality; loose clusters, resists cracking. Mars Blue Hardy Early High productivity; medium cluster. Reliance Red Hardy Early Season High quality; productive; uneven color; susceptible to berry cracking. Vanessa Red Hardy Midseason Adherent skin; tight clusters; firm, crisp fresh; small berries. Jupiter Blue Moderately Hardy Early Muscat flavor; oval berries; very large. Neptune White Moderately Hardy Midseason Compact clusters; low vigor; adherent and thick skin; oval berry. Suffolk Red Red Moderately Hardy Midseason Loose clusters; good flavor. Cayuga White White Moderately Hardy Midseason Fully ripened, produces labrusca character. Chambourcin Blue Moderately Hardy Late Moderate vigor; large clusters; needs thinning; high quality wine. Chancellor Blue Hardy Early Midseason Fruit thinning necessary; good vigor. DeChaunac Blue Hardy Midseason Moderate red wine quality; good vigor and productivity; requires fruit thinning. Seyval Blanc White Hardy Early Midseason Moderate vigor; requires thinning; excellent wine quality. Vidal Blanc White Moderately Hardy Late Midseason Good vigor; late budbreak, requires thinning; loose clusters; excellent wine quality. Vignoles White Hardy Midseason Small tight cluster; moderate yields and vigor. Depending on the cultivars selected, grapevines will produce berries that may be red, blue, white (greenish-yellow), purple or black with a distinctive flavor. Both seeded and seedless types are now available. In Ohio, the earliest cultivars ripen beginning about mid-August, while the latest cultivars ripen fruit from late September to early October. By selecting and planting different cultivars in the home planting, the gardener can spread the harvest over several weeks. However, if interested in planting only a few vines or even an isolated single vine, the gardener may do so without worrying about the necessity of planting different cultivars. Grapevines available to gardeners are self-pollinated or self-fruitful. Bees are not required for pollination. Disease tolerance is another important factor to consider since wet springs, and hot and humid summers tend to favor common diseases that attack grapes. Try to select grape cultivars that are least susceptible to diseases (Table 4). However, there are no grape cultivars that are truly disease resistant. Neptune ? ? ? ? Suffolk Red ? ? ? ? Key to ratings: * = slightly susceptible or sensitive; ** = moderately susceptible or sensitive; *** = highly susceptible or sensitive; ? = relative susceptibility or sensitivity not established; (1) = berries not susceptible. Early spring is the best time to plant grapevines. Fall planting is not recommended because plants are likely to be lost to heaving during the first winter. During the first year, the soil is prepared for planting, cultivars are selected, and vines are planted, mulched, fertilized and kept free of weeds, insects and diseases. 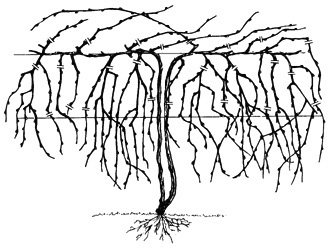 Prune off broken or dead portions of branches and roots. At the same time, prune top growth to a single cane. During the first year, the vines are normally tied to a stake to keep them off the ground, prevent damage and make spraying more effective. If the season of planting is dry, supplemental watering is also necessary to keep the vines growing. It is important to get a good amount of growth during the first year. Three years are normally required to establish a grape planting. Vines planted for training on a trellis are normally placed 8 feet apart, while those planted for training on an arbor can be placed 4 feet apart. Before growth begins the second year, a support for the vines, either a trellis or an arbor, must be provided. Care of vines the second year is similar to that of the first year. However, during the second season, a system for training the vines should be selected. 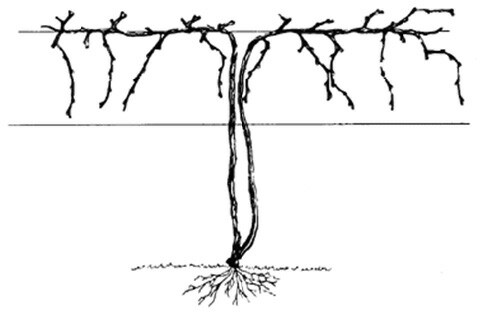 Vines are trained to a particular system by pruning and tying the canes to the support system. In some methods of training grapevines, the canes are tied to wires above the trunk and arms of the vines. Such training works well where grapevines are to be grown on a fence or in an upright position. In another method of training, the canes are tied to the wires and the fruit bearing shoots are allowed to droop or hang down. A third method is the cordon type training system. Here the fruiting canes are developed from a horizontal extension of the trunk called a cordon. If canes are pruned long, they can be tied to the lower wires. If pruned short, they hang free. One of the most common training systems is called the single curtain/cordon bilateral system (Figures 2 through 4). Figure 2. Shown here are the grapevines trained to the single curtain/cordon bilateral system during the fruit harvest season when the rows are covered with bird netting. Photo by Gary Gao, OSU South Centers. Annual pruning is important in maintaining a uniform yearly production of quality fruit. The best time to prune grapevines is in the dormant season after the danger of severe cold weather has passed. In Ohio, this is usually in March. Learning to prune grapevines requires practice and experience. When pruning grapevines, it is important to think about fruiting canes for the coming year and renewal canes for the year after. Longer canes will likely produce fruits while one-bud or two-bud spurs will likely produce long shoots without fruit clusters. These spurs are called renewal spurs and will serve as the fruiting canes during the third year. Grapevine pruning is a constant fruiting and renewal. Gardeners should cut all long canes back to five buds first. Leave a ½-inch stub when making pruning cuts. Then prune every other five-bud cane back to one or two buds. Mature grapevines before and after pruning can look quite different (Figures 3, 4). Figure 3. Shown here is a mature grapevine before pruning. Please note the locations where suggested pruning cuts are made. Figure 4. Grapevines trained to single cordon bilateral system. The line drawings are provided by the CFAES Marketing and Communications through Ohio Agricultural Research and Development Center. It is beyond the scope of this fact sheet to describe grapevine pruning in detail. Gardeners should refer to the OSU Extension Bulletin 940, Midwest Home Fruit Production Guide and OSU Extension Bulletin 919, Midwest Grape Production Guide, for additional information on pruning and other cultural management practices. Both bulletins can be purchased from your local Extension office or OSU Extension’s eStore (estore.osu-extension.org/). Gardeners should also attend training programs on grape pruning. Nothing beats the hands-on training when it comes to grapevine pruning! Gardeners are encouraged to do a soil test of the potential site for their grape planting for fertilizer and lime (or sulfur) recommendations. Grapes typically perform best where the soil pH is between 5.0 and 6.0. Apply lime only when soil analysis indicates a need. Commonly suggested rate of fertilizer application in a grape planting is 8 ounces of 10-10-10 fertilizer per plant seven days after planting. Increase the amount of fertilizer to 1 pound of 10-10-10 in the second year and 1.5 pounds per vine in the third and later years about 30 days before new growth begins in the spring. Do not concentrate fertilizer at the base of the trunk. Keep fertilizer 6 to 12 inches from the trunk and spread evenly under the spread of the vine. During the third season, some harvest may be expected from the vines. The first full crop, however, will not be produced until about the fourth or fifth year. It is important that cultural practices of maintaining soil fertility, weed control, soil moisture conservation, and insect and disease control be continued not only during the third year, but in subsequent years as well. Control weeds by hand hoeing or with plastic or organic mulch. A clean area 1.5 to 2 feet on each side of the vine is necessary. Do not damage trunks with a hoe or chemicals. Grapes certainly have their share of insects, mites and diseases. 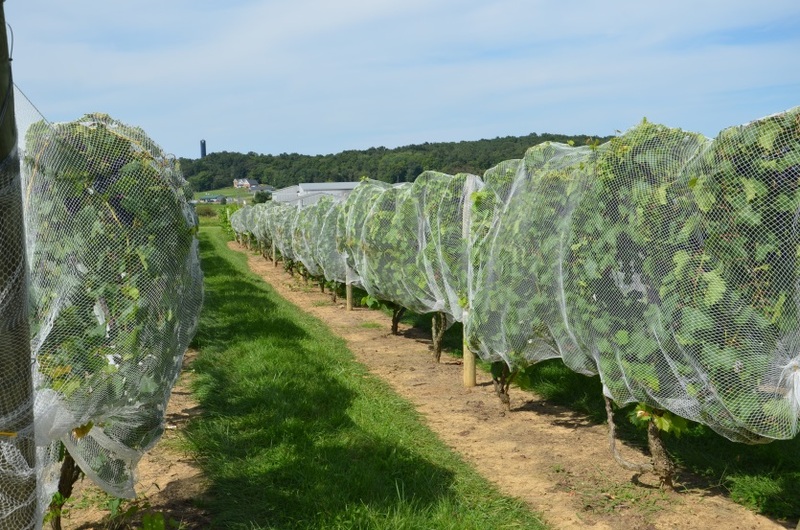 Selecting disease tolerant cultivars, good sanitation practices, managing vine canopies for good air movement, pest scouting, and an effective spray program are all part of a successful pest management program. Common grape diseases are black rot, downy mildew, powdery mildew, phomopsis cane and leaf spot, and botrytis bunch rot or gray rot. Major insects and mites on grapes are grape berry moth, Japanese beetle, grape flea beetle, European red mite, grape root borer and grape phylloxera. Refer to OSU Extension Bulletin 780, Controlling Disease and Insects in Home Fruit Plantings, for more information. There are also fact sheets available on the management of selected grape diseases and insects. Gardeners are also encouraged to purchase a copy of the OSU Extension Bulletin 940, Midwest Home Fruit Production Guide, for additional information. Home fruit growers can have a great deal of success with grape production if they know what is involved and are willing to do the work. It is also a very rewarding experience to be able to grow your personal favorite grapes that are not available in grocery stores or farmers markets. In addition, home grape growers will get a greater appreciation for high quality grapes produced by commercial grape growers in Ohio and beyond. Dami, I., B. Bordelon, D. Ferree, M. Brown, M. Ellis, R. Williams, D. Doohan. 2005. Ohio State University Extension Bulletin 919, Midwest Grape Production Guide. The Ohio State University, Columbus, Ohio. Ellis, M, and C. Welty. 2010. OSU Extension Bulletin 780, Controlling Disease and Insects in Home Fruit Plantings. The Ohio State University, Columbus, Ohio. Gao, G., R. Becker, M. Brown, M. Ellis, S. Prochaska, C. Welty, and R. Williams. 2017. Ohio State University Extension Bulletin 940, Midwest Home Fruit Production Guide. The Ohio State University, Columbus, Ohio.